The editorial group of El Libertario, newspaper of CRA, Comision de Relaciones Anarquistas from Venezuela, reflect on the prospects for the country after the seemingly indisputable electoral victory of Hugo Chavez. Venezuela has landed on the dark side of the moon. The recently opened 21st century seems to be escaping us for good. We will not have a chance to face it with any prospect of success. Eight years of speeches drawn from a time past, eight years of inefficiency in the management of public funds, of unstoppable corruption, of the waste of immense riches, of awful public services, of leaving the most basic necessities unsatisfied, of unemployment, of the breaking down of the industrial infrastructure, including the oil industry, of no social security, of charity as a way of survival, of lies and debasement as pervading attitudes...eight years of totalitarian control over the social and political system by the faction in power, of lack of ideas and of any initiative which could mark the way, of deprivation of the educational establishment.....yet eight years of all this have not been enough to make it clear to a substantial fraction of the people that a change was needed. 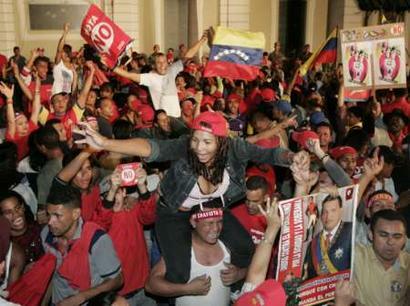 And they voted to keep Chavez in power. We don’t say to keep him in office, we are saying to keep him in power. A totalitarian power, a personal power which covers every aspect of life in this country, whether it is in politics, in the judiciary, education, economics, culture, society...even in sports. A blind power as well, and irrational, because power has no need for reasons. A power without aim or direction, its only reason being to gather and accumulate even more power, supporting itself only on words. Words that have been repeated so often that they have lost all meaning and have ended up representing nothing indeed. A power based on promises that were made to be broken, on deceive, on propaganda, on the irresponsible waste of resources that is typical of the spoiled heir to a fortune which he didn’t put any effort to make. A power present everywhere, of the type that Stuart Mill, more than 150 years ago, in 1859, thought characteristic “of an underdeveloped society, in which the race must be considered as not yet mature enough”. A power which nullifies any possible future to this recent past which is our present. And this is what worries us most. Future. There is none. The regime is not to change, because it does not have the ideas to do it, nor the people to support those ideas, neither any reason why to do it. It will carry on doing what it has been doing up to now, gather and preserve power. It will continue on the way which has proved so fruitful to it this far, strolling forward in its pretence to supreme power and its monopolisation of riches. Even if it piles up failures on the social front, on the productive, on education, on health....it will still enjoy the self-righteousness of majorities. Why change anything if it still has the favour of the voters? Of course there is also that, when you are facing a power which is in possession of every conceivable mean, officially supported with more than a 60% of votes, totally centralised and self-centred, then there can be nothing but an impending sensation of powerlessness, with no ability to protest, only misery and deprivation for the people for the sake of their great leader, like those women who debase themselves just to dress their men up. Only that...just for now. There is also, like a threat, the violence that might be when the people realise what comes out of their choice, that every way in which they could vent their anger or make their demands has been closed. That their vote was cast for voluntary servitude and that they chose to slam the door on the face of any other alternative. That they chose the army barracks as their life style, barracks with a general of their own. That they chose subservience for life that they gambled with their freedom and changed it for vague promises of power and riches, never to be fulfilled. They voted for love, or so would Chavez’s electoral slogan have us to believe, disregarding the fact that the saying: “with you, bread and onions” has been outdated for a long time. Especially when it is always the same ones who have the dry bread and the rancid onions, while there is matured single malt whisky for those in government. There are a few more things that can be said about the elections. Can any one swear for the results that we have been given? We can only know the numbers that were made public which, strangely enough, are exactly the same as in the untrustworthy opinion polls, and which the government, the opposition, the CNE (the country’s national electoral organisation) and external observers were quick to accept. But, can you believe them? Maybe there is a proof of it in the fact that when the whole country was bracing itself for a conflictive Monday, full of tension and maybe even violence, nothing happened. There were no celebrations by the winners, no protests by the losers. On the 4th of December we were all hung over, but without having drunk a drop. One thing is true, we were treated to the show of an opposition sending its speakers out to do their best to convince every one that they had lost, but that defeat made it the winner. Interesting aspects of the politician’s logic in the Caribbean! Faced with this voluntary surrender to power we can only remind ourselves that any one who allows others to choose for him a style of life and to set his goals he only needs to be able to imitate, as children do. But, even if he is successful at it, he is not a more principled human being because it is not only a matter of what men do, but also of what kind of men do it. Of all the things that men can do the most important is man himself and asking others to replace him it is to give up the best one can do. Everything points out that individuals are getting lost under mediocre leaders, who are limited both in intelligence and inclinations, and that they have chosen to submit to the rules of behaviour that those leaders mark. In the unlikely case that these leaders might have a philanthropic instinct (but nothing makes us suspect it), then this generosity would be born out of a very limited conception of life, and its only aim would be to curtail any indication of disagreement, public or private. Leaders that, in their will to control, have set their aims to standardise us so that all opposition to their powers and checks on their control are banished. If the majority of the people, who are more and more deprived, are still supporting the regime one can ask himself: might it be that the Comandante is the true representative of the Venezuelan spirit as the comedian Zapata says? A deceiver, a liar, a self profiteering, unpunctual, unthankful, and uneducated.... If it is not so now maybe after 14 years of Chavista power it will probably be so, as he will have made a country to suit him by then. That is, small, both culturally and morally speaking, and so will be the size of its people. And by the time that Venezuela exits this dark side of the moon, as it already happened once by the mid 20th century, it will again be lost in a world unknown to it, and it will have to start all over again. Maybe then, the Chavez Generation (by 2013 those in their thirties will have spent half their life under this regime) would consider a political success to come up again with the Pacto del Punto Fijo (the agreement between parties which regulated the Venezuelan political life from 1958 to 1998). It would follow the same logic, by which Chavez was first elected on the same program that Cipriano Castro had used at the beginning of the 20th century. They say that history is repeated three times: first as an epic, later as a critique and a drama, and finally as a farce. Today the Venezuelan people have chosen to confront the challenges of the 21st century guided by the Chavez family, with the necessary help and enlightenment of Lara, Rangel, Acosta Carlés, Chacón, Cabello, Reyes, Tascón, Maduro, Flores, Isturiz, Ramírez, García Carneiro, Varela, Escarrá, Alí Rodríguez, Isaías Rodríguez, Merentes, Giordani, Tarek, Barreto, Bernal, Valero, Arias Cárdenas and their relatives. With these names it is obvious that what is coming is certainly not an epic, and we don’t know if we feel like crying or laughing. Latin America seems to be trying to remain chained to its patriarchal and rural past, in which it feels so much at home, regardless of frustrations and failures, waiting in that centuries long cultural childhood, itself ailing and ineffective, which makes it rely on self-proclaimed incarnations of destiny. Like Peron, Pinochet, Fidel or Pancho Villa. Now that Pinochet is dead and Fidel is following, the figure of dictator-father-messiah-prophet, that has made so much damage, is re-enacted in Venezuela by this vociferous comandante, exactly as it happened with its predecessors. A comandante with nothing to show for, who never took part in any combat, who sent others to die and suffer to further his glory, who lost all the battles he started, avowedly for our benefit, but which have only helped his entourage. This dictator-father-messiah-prophet has been elected today as the people’s generational role model. The task for reconstruction, not yet construction of anything new, will be long, painstaking, full of tears and sacrifices and will demand the best characters and consciences to get on with it. Nothing of this has ever been lacking to the anarchists who, today, seem to be the only way to an alternative future, considering the opposition and the pro-government factions that we see around us.